The original recipe can be found here. It is also located on page 77 of the Taste of Home Christmas Cookies and Candies. If you love peanut butter cups, peanut butter balls, or buckeyes this recipe is for you!! This was so simple and yet soo amazing! I will make this every year. It gives the same great taste of peanut butter balls but with so much less work and less ingredients. This recipe only has 3 ingredients! In a large microwave-safe bowl, melt the candy coating and stir until it is smooth. Repeat the procedure with the chocolate chips. Stir the peanut butter into the candy coating. Thinly spread onto a waxed paper-lined baking sheet. Cut through the mixture with a knife to swirl the chocolate. Break into pieces. Store in an airtight container in the refrigerator. 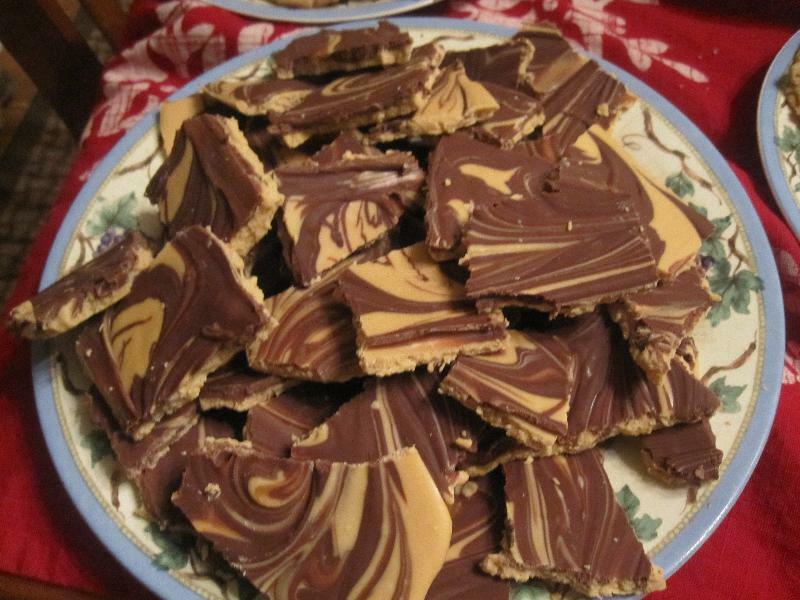 Description: Peanut butter and chocolate an amazing combination!